The popular Datsun Armchair is a stylish, mid-century design chair. Upholstered in top grain genuine leather in a vintage brown finish with natural textures and grains with decorative channel stitching and a solid oak angled frame. The Datsun Armchair has a cushioned seat and back and is supported by a solid wood frame. W640 x D700 x H765 mm. 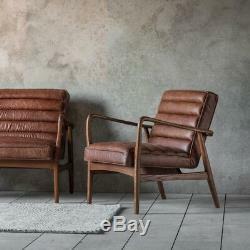 The item "Datsun Armchair Vintage Brown Leather Lounge Office Mid Century Modern Retro" is in sale since Sunday, March 24, 2019.